A thriller about a New York City police detective who tracks a copycat serial killer. 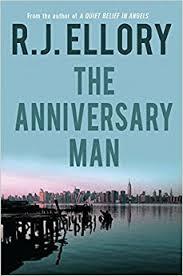 The Anniversary Man is the second and affirms Ellory’s title as monarch of psychological crime thrillers ... In this bleak examination of murder and hope, Ellory’s herrings are as red and sticky as caramelized apples, and there are more dead-ends than Manhattan riverside real estate ... Written as though by a native New Yorker, it needs to be read twice –– once for vice-grip-like details, and again for nectar from the consummate wordsmith. So real is Ellory’s writing that lines between journalism and crime fiction blur ...Detective Irving has the makings of Michael Connelly’s Harry Bosch on steroids, sure to be a repeat character –– and made with cinematic success into a blockbuster movie. NYPD Detective Ray Irving — overworked, underpaid, and absolutely dedicated to his job — risks his sense of ethics and, ultimately, his life to track down a serial killer who is imitating the crimes of some of the worst monsters in history. Entirely free of formula, Ellory’s breakthrough procedural should give him the kind of acclaim in the U.S. that he enjoys in his native Britain. The author provides ample details to animate Irving and his Manhattan, but neither the man nor the place equal the vibrance of Costello and his Jersey City ... Langley points out to Irving that the present-day killings occur on the anniversaries of the earlier murders. Aided by Langley and Costello, Irving digs through a massive haystack of serial-murder cases to find a needle — another case the killer will recreate. After several dead-ends, the three face off with the Anniversary Man in a tense scene in Madison Park ... Ellory’s prose is rather colorless, the plot lacks pace and momentum and Irving, at the center of it, is lackluster. What did you think of The Anniversary Man?